It's time for another Dirty Dozen/Alumini challenge, and it's a fun one! We were to create a Valentine with some kind of texture, but not include the color red. I knew I wanted to use my new So Much Love set from Lizzie Anne Designs. Aren't these little birds the sweetest? I stamped them on the Bashful Blue, trimmed them, and adhered them to the stamped Very Vanilla circle. Quickie Glue pen and Dazzling Diamonds were used for the sparkly hearts. The embossed heart background was created using my Heart Blocks Cuttlebug folder, and the flower with my Daisy Die. I think everything is pretty straight-forward, but if you have questions...just let me know. So pretty!!! Love the non-traditional colors. Those birds are definitely sweet Rose Ann! Love the softness of this lovey card!! I was excited to play along this month! Awwwww, cute birds and I love the colors you picked! Very sweet! This is so adorable Rose Ann! I love the embossing, the scallops, and the daisy flower. So pretty! Rose Ann, what a precious card! The soft and pretty colors, the scallops, the embossing...it's all perfect! And, I just love what you did with the adorable images!! 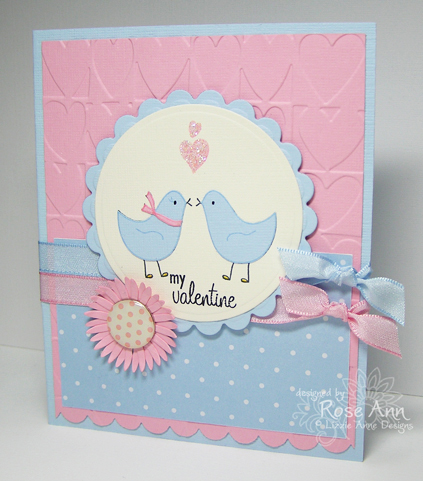 beautiful card Rose Ann, love the embossed background, those sweet birds and the double bows are so cute! 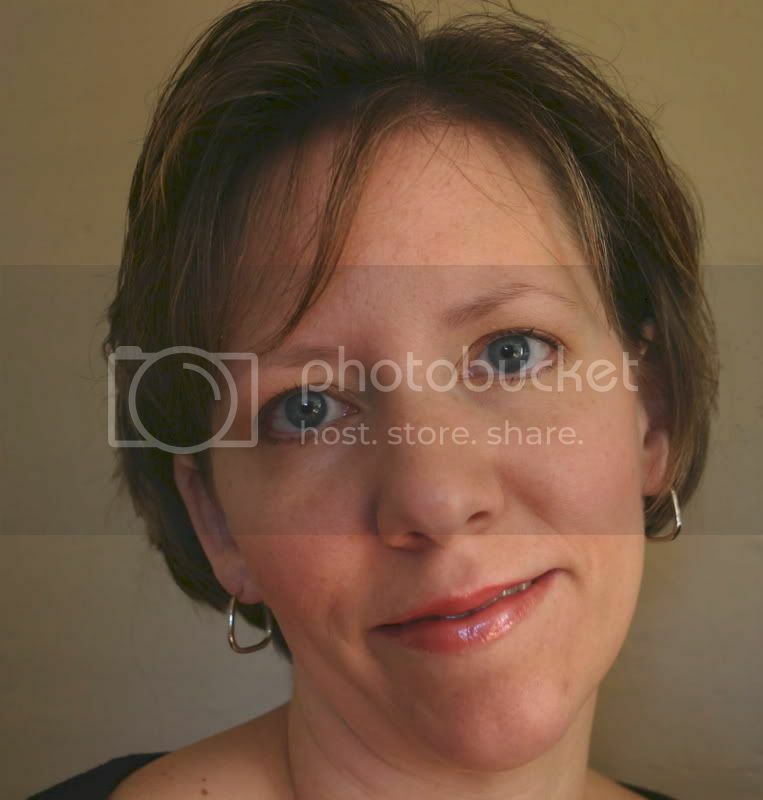 So sweet and pretty, Rose Ann! I don't miss the pink or red at all! What a cute card! I love the soft pink and blue - and those birds are super adorable! Oh Miss Rose Ann, I love your sweet soft colors, so darling. This is sooo adorable, Rose Ann...I love the pink and blue and the little birds are so sweet!!! The flower with the brad center, ribbons, scallops, bugged bg....everything is just beautiful!! Love these colors...so soft and delilcate ! Rose Ann! This is drop dead darling! I love the look of paper piecing on solid cardstock. Awww...very CUTE Rose Ann!! Love the cuttled hearts layer and those birds are adorable. Nice job!! Terrific...love these birdies in this sweet color combo. This is so wonderful. I love the layout and the colors. Perfect Rose Ann! love it, so cute. that is a challenge to not use red. but i love the outcome. Oh so feminine and sweet! I love that special flower center too! THIS is so cute! I have this set on order! Hope it gets here soon! Valentines are my favorite cards to make and yours is absolutely adorable!!! I just LOVE this Rose Ann! The colors are so soft and pretty together, and I LOVE the birds and your layout!! Super sweet littl birds! I love the flower and brad you added! This is just the sweetest card!! Oh I love the double ribbon, that brad and flower and the sparkly hearts. Those little birds are so cute! This is gorgeous and I love the colors! Super sweet! I love the colors and the two ribbons!